Think of Me. The velvety soft pansy’s sweet upturned bloom seems to whisper this simple request. In fact, the pansy flower itself is named after the French word pensée - meaning ‘thought.’ The pansy and its emblem was held in great regard by the Victorians, who admired its virtues of tender attachment, concern and compassion. 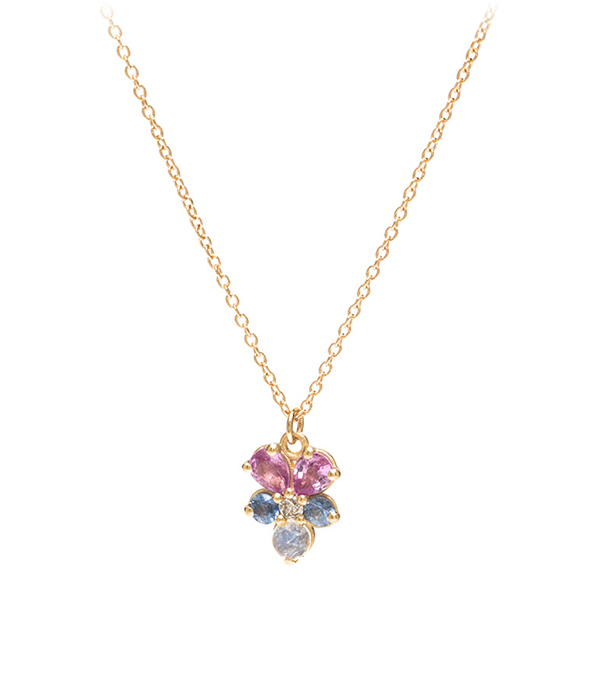 Our petite gem-set 14K matte yellow gold pansy pendant features pink and blue sapphires, a twinkling diamond (0.05 ct) center and dreamy blue moonstone accent. Hanging from a delicate gold cable chain, this colorful charm necklace makes a perfect gift for a treasured friend or loved one. Chain measures 16”. Categories: Language of Flowers, Necklaces.